Share the post "DVD review: PAUL RODGERS, RORY GALLAGHER, THE DOOBIE BROTHERS (Special Editions)"
This series of special editions from Eagle Rock bring together a bundle of three DVDs by an artist and at a special price. A great way of catching up if you missed them first time round. 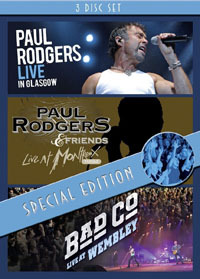 PAUL RODGERS has most recently been schmoozing with the soulful musicians of the Royal Studios in Memphis but this 3-disc set is a fair cross-section of his work over the past two decades. Live At Montreux 1994 was recorded when Rodgers was promoting his ‘Muddy Water Blues’ album and he is joined by heavyweight friends Brian May and Steve Lukather amongst others. 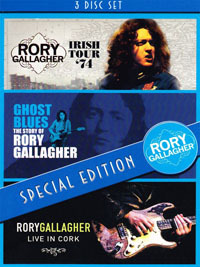 RORY GALLAGHER has been rightly celebrated in recent years with a complete reissue of his albums and most recently an expanded ‘Irish Tour ’74′ set. The definitive documentary by Tony Palmer is also included here, a remarkable insight to the troubled times in Ireland and when Rory pushed more than musical boundaries. 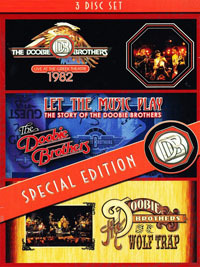 THE DOOBIE BROTHERS special edition is essential for those who want to investigate these masters of melodic rock. Let The Music Play… follows the band over four decades of music making with bonus live performances whilst the band’s ‘farewell tour’ is captured on Live At The Greek Theatre 1982 although they reformed five years later. By the early eighties the band had morphed into a more AOR outfit with Michael McDonald on vocals epitomised by ‘You Belong To Me’ and ‘Minute By Minute’. Also available in this series, Tina Turner (filmed in 1996, 1999 and 2000), Jethro Tull (2001, Montreux in 2003 and German TV footage 1970-1993) and Gary Moore (Montreux in 1990 and 2010 and London 2007). Excellent gift ideas, with remastered audio and visuals, and well-priced too. This entry was posted in All Posts, DVD REVIEWS and tagged Bad Company, blues, concert, documentary, DVD, Eagle Rock, Ghost Blues, interview, Irish Tour '74, Let The Music Play, Live At Montreux 1994, Live At the Greek Theatre 1982, Live At Wembley, Live At Wolf Trap, Live In Cork, Live In Glasgow, Paul Rodgers, review, rock, Rory Gallagher, special edition, The Doobie Brothers. Bookmark the permalink.